I love when our playtime turns into math fun! Last week I saw the idea for a rainbow sorting tub at Make, Do, & Friend. I was pretty much sold on it when she said it kept three 2 year olds occupied for 30+ minutes! I went around our house and collected a bunch of solid color toys and threw them in a bin. They've played with it on the table. They've played with it on the floor. They've built and they've stacked. A great book to go with this tub is What Makes a Rainbow? I found this book reviewed at Critters and Crayons and then weas able to find a copy of it at Target! This book also incorporates play into learning. A little bunny sets off to find out what makes a rainbow. As he encounters animals of a variety of colors, a colored ribbons is added to the page. By the end of the book, the bunny has found what makes a rainbow, and the child has created a rainbow by turning pages. We will be exploring rainbows all week to gear up for Spring and lucky St. Patrick's Day! Don't forget World Read Aloud Day is Wednesday March 7th! Share a book with someone. There is still time to sign up here. We have the book "What Makes a Rainbow" and really enjoy it. 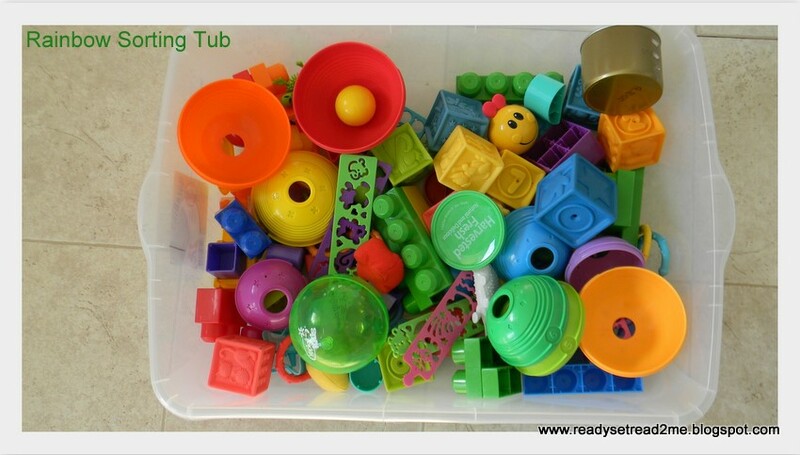 Love the idea of a rainbow sensory tub. Looks like fun. This post has totally inspired me to make a rainbow sensory tub for this week! Thank you! Found your blog through Thrifty Thurs and LOVE it!